The fourth album from the Austin band has been named after the fourth letter of the alphabet. Things can be so simple. Their last album The Last Days of Summer was even a free download. On that album the guys from White Denim already got enforcement from an additional guitar player so they are with four since then. They were able to broaden their already big spectrum with that even more and deepen their sound. The previous three albums all were impressive. The wealth of styles with especially a combination of seventies rock and psychedelica were performed on a high level. On this new record they seem to have put even more on top of that. You really have to sit down for it though. It isn't always easy what the gentlemen are doing and therefore their music may not be easily accessible to anyone. But once you're into it you will perceive true beauty. Slowly you'll get sucked into White Denim's world, with the conjuring high and somewhat pinched voice of James Petralli. The record has a high tempo and different styles like americana, blues, fusion and even latin are tumbling over each other. It may at best be compared to the music of Motorpsycho, who present a tangle of styles as well and play nice long jams. The album leads off with a summery and woolly 'It's Him'. Then it's full force in 'Burnished' with a great solid groove that ends in a short jam. As does the roaring 'Bess St' that suddenly goes into another direction. The band uses these kinds of twists more often so your attention won't flag for a moment. As mentioned you can hear latin influences as well namely in the nervous 'River To Consider' where a flute is used. Finally it ends in a dizzying climax. 'Is And Is And Is' on the other hand sounds like The Beach Boys on a firm LSD trip. 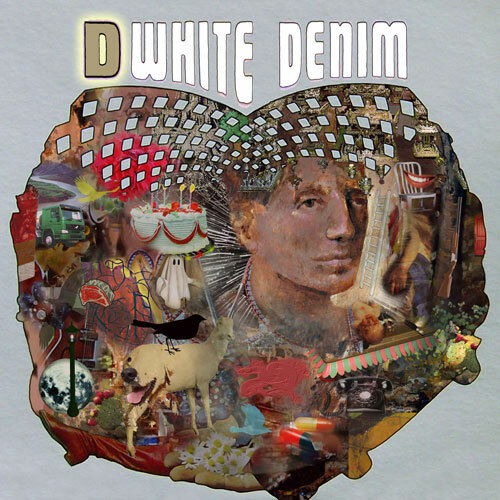 White Denim delivers a beautiful album. It's a crazy trip along the many different musical landscapes. But it still sounds as a whole because of their own jazzy sound. The tracks are very clever compositions and the record has a nice flow. You won't get bored by it quickly. Especially since it takes several spins to grasp the album and to discover al the details. "D" will get you high without being on drugs.